WEYMOUTH, Mass. 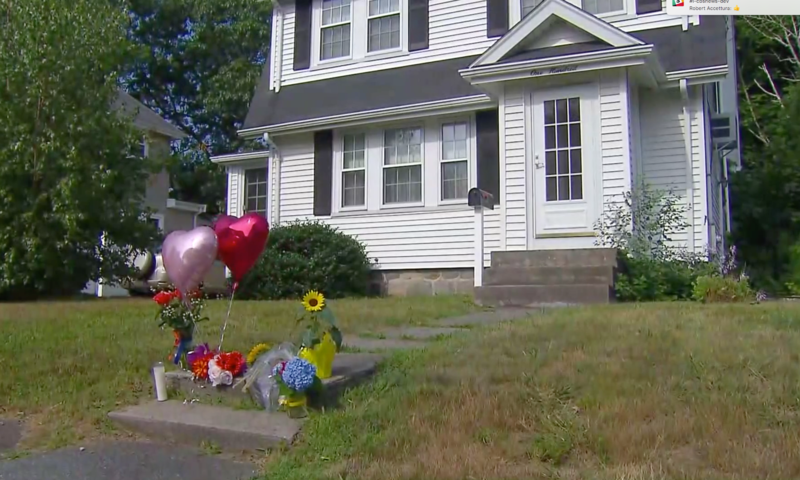 -- Neighbors mourned a 77-year-old woman on Monday who was fatally shot in her home during a shooting that also took the life of a police officer, CBS Boston reports. Vera Adams was in the sunroom of her house Sunday morning when police said she was shot by 20-year-old Emanuel Lopes as he ran from Weymouth Police. They said Lopes had just killed officer Michael Chesna with Chesna's gun before he fired at Adams' home. Lopes was shot by another officer and arrested. He will either be arraigned at his hospital bedside or in court possibly Tuesday. Neighbors brought flowers, balloons and candles to Adams's house Monday, many rattled by the entire experience. Sue Nichols lives right next door to Adams. "It breaks my heart," she told CBS Boston's Gary Brode. "I'm looking out my window, like I'd see her in the kitchen, bopping around, you know. Her light was on, her upstairs light -- just weird that she's gone." South Shore Hospital employee Mary Dore said, "In her last moments, she was alone, and in this house, by herself until they found her. So it's sad, it's awful." "To have yellow crime scene tape in your own neighborhood, it was really upsetting," said Maureen Carson. "This is an awful day for Weymouth and for Massachusetts. Our hearts are very much with the surviving families of these victims," Morrissey said. Weymouth Police Chief Richard Grimes described Chesna as a 42-year-old Iraq and Afghanistan War veteran who leaves behind a wife and two young children, ages 9 and 4. Chesna was from Weymouth and graduated in 1994 from Weymouth High School. Grimes said he had spoken to Chesna's mother and she told him that her son joined the military "to open the doors to get in this job." Chesna's body was transported from the hospital to the state medical examiner's office in Boston. Dozens of police officers saluted the vehicle carrying his body as it passed by. Officers also lined the route Monday when the body was returned to Weymouth.